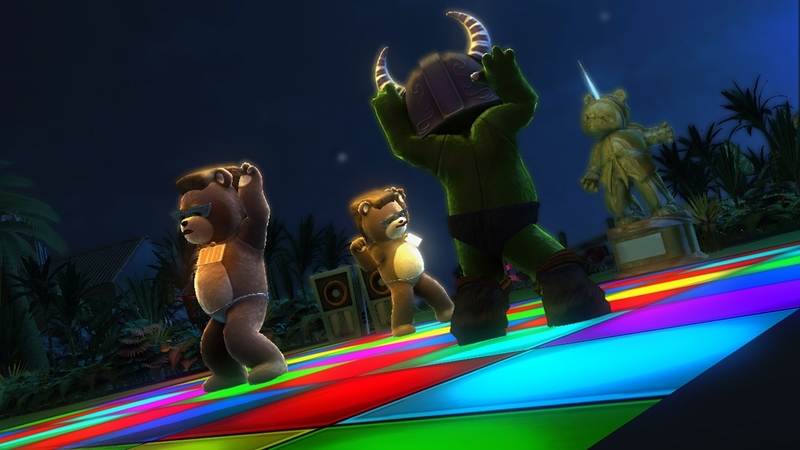 The original Naughty Bear game had an interesting concept. Ignored and cast-ed out from your fellow bears, you controlled Naughty as he set out punish others using various tools and traps similar to Manhunt or Hitman. While it was critically received as an interesting but poorly executed title, I find myself enjoying the title. I agreed that the $50 price point was too much and many felt it would be better suited as an downloadable title, which Panic in Paradise is. Although this game is downloadable and priced at $15, Panic in Paradise has more content and polish than the original title with more targets to go after, weapons to use, and environments to explore. 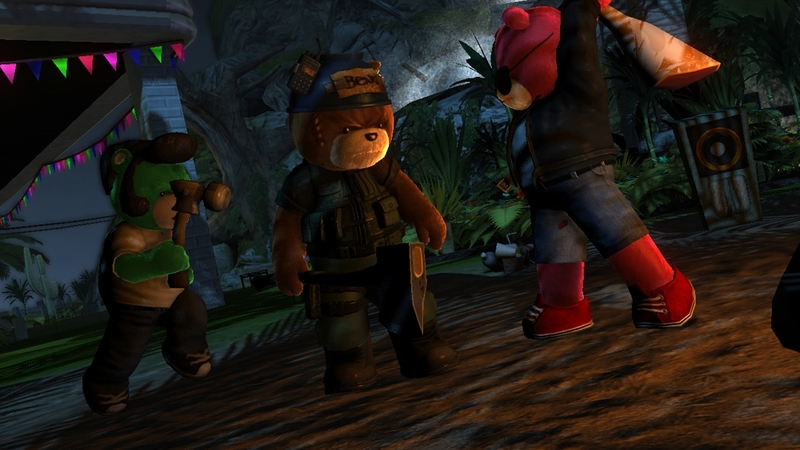 Each target bear is unique, with missions requiring you to take them out in specific ways. 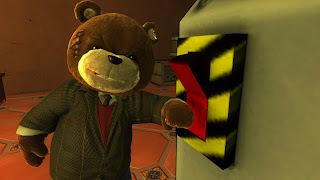 Aside from the main goal of punishing the bears, each mission also has sub-objectives that reward more points and money which get you new items for Naughty to wear and use. The outfits you find will give different attributes that help in terms of agility, strength, and power of your Naughty scream. Panic in Paradise has a leveling system which is based on experienced earned from using weapons and various outfits. 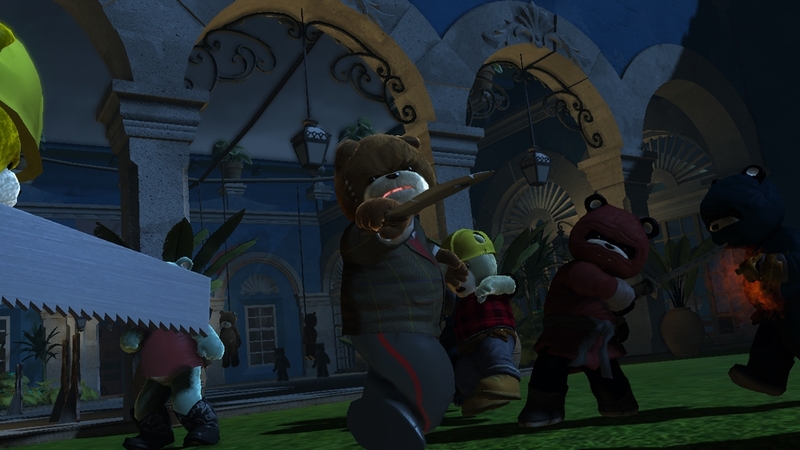 Taking out bears in the levels and stealing their costumes will allow you to wear them when you replay missions, and weapons used to kill the bears will also be unlocked for you to use. Using these new weapons and outfits will earn you more experience, but the game automatically uses the points to upgrade specific skills for you. It's a system that seems to work well, although others may want to choose what gets upgraded and when. Visually the game looks nice and the controls are simple enough, but I did encounter a few issues such as freezing and issues with the weapon animations. The sound is great though and the original narrator from the first title is back, ready to aid you in your quest to punish the bears on the new island. If you enjoyed the first title and wanted a bit more from the game at a lower price, Panic in Paradise is worth checking out. With tons of new bears and various challenges to tackle, you'll get a solid 5-10 hours out of the game plus leader-boards and the replay-ability factor for each mission. "When the Bears of Perfection Island went on holiday to Paradise Island, Naughty Bear was not invited! Naughty Bear manages to secretly travel with the other bears, duct-taped to the exterior of the bus. With a list of bears who wronged him in hands, Naughty is ready to make them pay, one by one."